Home > Causes of Hair Loss > What Causes Male Pattern Baldness? 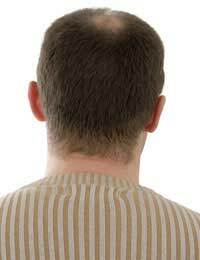 Male pattern baldness, also known as androgenetic Alopecia, is the most common cause for hair loss in men. The resulting hair loss is irreversible and follows a consistent pattern with hair loss or hair thinning beginning at the front hairline or temples and progressing back towards the base of the skull. Male pattern baldness rarely results in the complete loss of hair on the scalp, instead the condition usually progresses until the top of the scalp is bare but hair remains in a horseshoe shape around the head following a line of growth from just above the ears. Currently there is no way to prevent male pattern baldness from occurring and the exact causes are yet to be totally understood. However, doctors agree that androgenetic alopecia has both hormonal and genetic influences. Hair follicles in the scalp are stimulated into growth, shedding and resting phases by a multitude of hormones and enzymes. However, the most important hormones to the Hair Growth Cycle are testosterone and DHT. DHT (dihydrotestosterone) a derivative of testosterone plays the biggest part in male pattern baldness. During puberty, testosterone and DHT are responsible for simulating the enlargement and growth of hair follicles on the scalp, underarms, facial areas and pubic area. This stimulation causes the increased hair growth associated with puberty. However, these same hormones may cause the shrinking of hair follicles later in life. In cases of male pattern baldness, the response to DHT in the hair follicles of the scalp seems to be more pronounced and the shrinkage helps support the breakdown of the follicle until it is no longer able to produce hair. This process is also helped along by genetics. The hair follicles in men who suffer from male pattern baldness seem to be genetically predisposed to be more susceptible to the harmful effects of testosterone and DHT later in life. This hereditary weakness makes it possible for the DHT to cause restricted hair growth more easily and fully on the scalp. It is thought that this weakness of the hair follicle is passed down through DNA from generation to generation. The genetic side of male pattern baldness can also help men better understand their chances of developing androgenetic alopecia and better understand how the condition will affect them personally. By studying the tendency for baldness on both the mother's side and father's side of the family a man can usually pinpoint his predisposition for hair loss. By determining if the men in the family tend to be bald, how severe their baldness is, what pattern the hair loss follows, and the age of initial hair thinning men will be able to predict their own baldness course and take steps to prepare for the eventual hair loss. If male pattern baldness runs in your family, you may want to schedule an appointment with your doctor to discuss treatment plans that can slow down the hair loss, surgeries that can replace the hair loss or options for covering the hair loss. Find about the type of treatments that are available by reading some of the features in our Treating Hair Loss section.